Sometimes the best laid plans….. 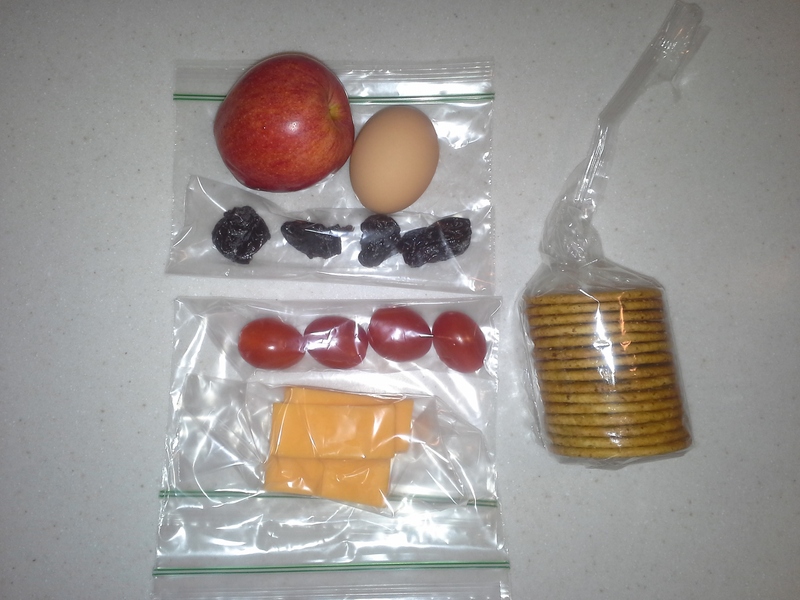 I packed a lunch to eat in between seeing patients. And I was planning on having more bean soup for supper. But, I had only gotten into the cheese and crackers part of the lunch when my brother called me. He and his wife and their two foster sons were travelling from Chicago to St. Louis and their car had broken down about 5 miles from my office. What are the odds? 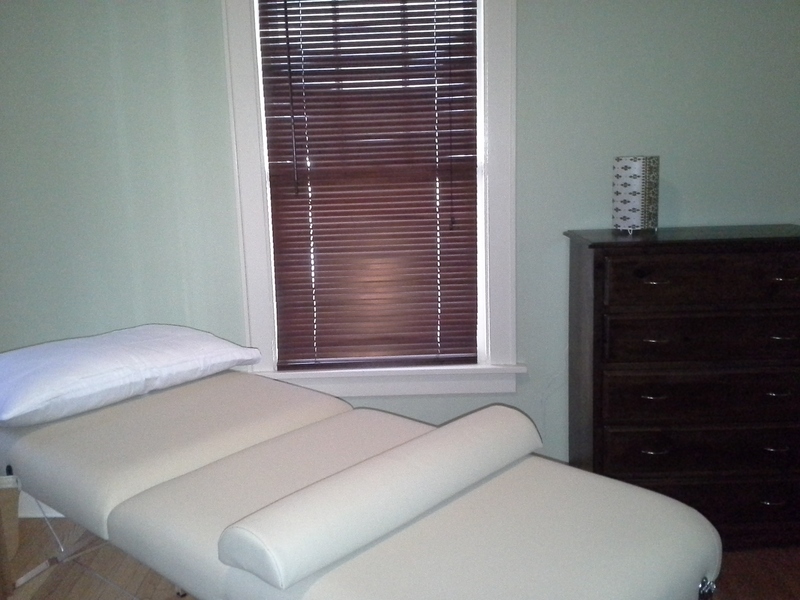 It is 297 miles from Chicago to St. Louis–so the chances of them breaking down on my doorstep are astronomical. Yet here they were. What then occurred was a Laurel & Hardy routine….unpacking all their stuff from their car to mine, getting their car towed, unpacking their stuff at my house, keeping two 8- year-old boys entertained, trying to find a rental car…..finding a relative to drive up from St. Louis, keeping the boys entertained…..so, by the time we had a plan and it was starting to come together, it was 3pm and no one had eaten. My beloved brother insisted on taking us all out to eat while they waited for their ride. My food costs for the day: $1.28…but you can’t plan for this kind of day. 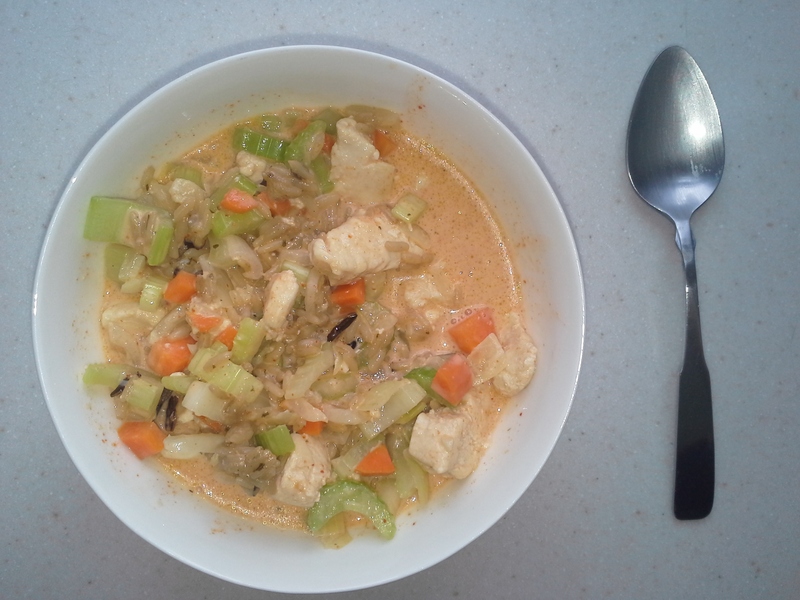 Lunch: I liked the Thai Chicken so much, I made it again, this time without broccoli, since I didn’t have any. And then my boyfriend treated me to dinner out. So my total food costs for the day: $3.15. If I had paid for my own dinner, it would not be looking so rosy. Breakfast was two slices of breakfast pizza and a cup of coffee that was provided by my employer for a meeting. It is certainly the least healthy thing I have eaten so for this week. Cost-0. 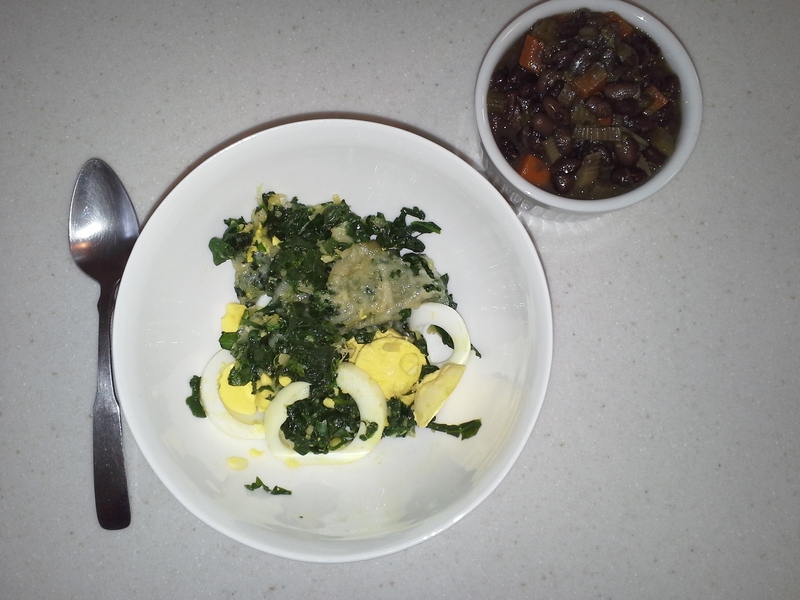 Lunch was the rest of the spinach/egg thing and black bean soup. I also had 1/4 cantaloupe .25. 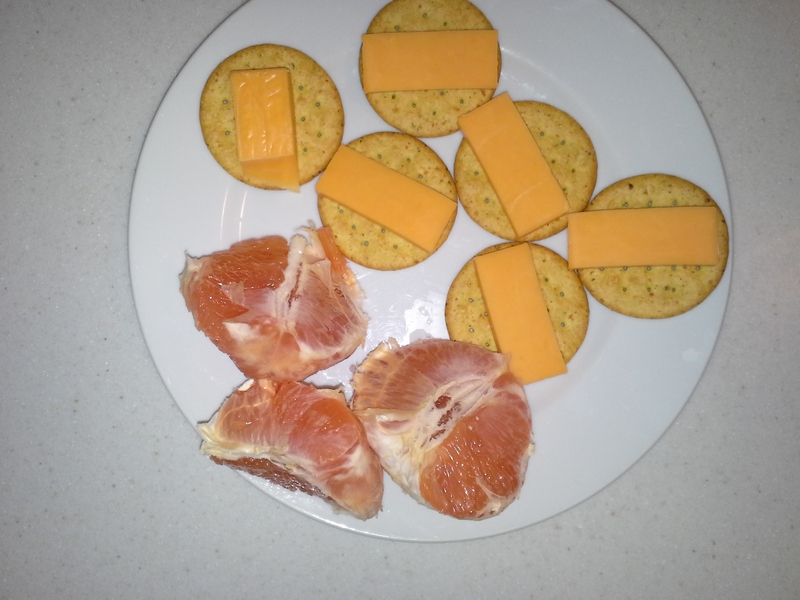 Cheese was .60, the crackers plus some I ate later in the evening were .30, grapefruit .35= $1.25. Later in the evening I ate 2 small chocolate bars I had bought to make hot chocolate .80. Lunch: I made subway sandwiches out of a whole grain baguette that was marked down to 0.49. 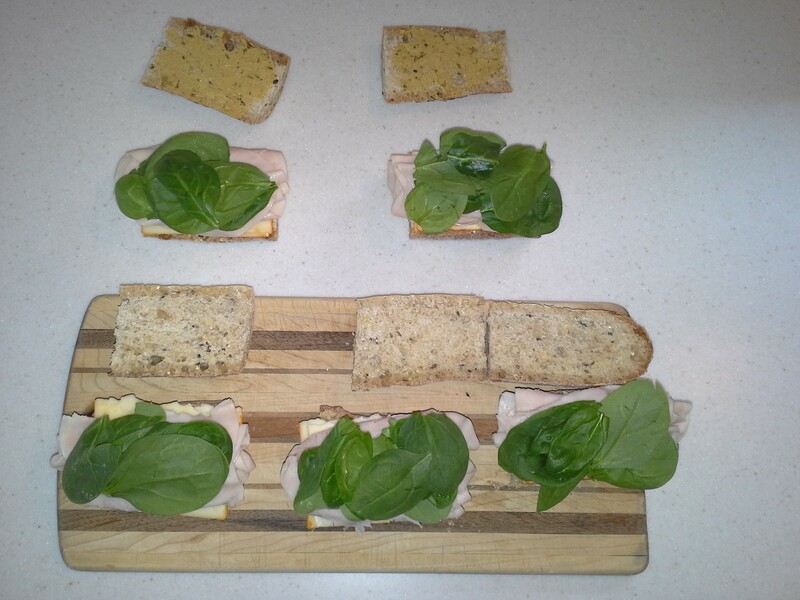 5 sandwiches from baguette, top two have mustard for me and bottom three are plain for the youngin. Cost of one sandwich is .96. 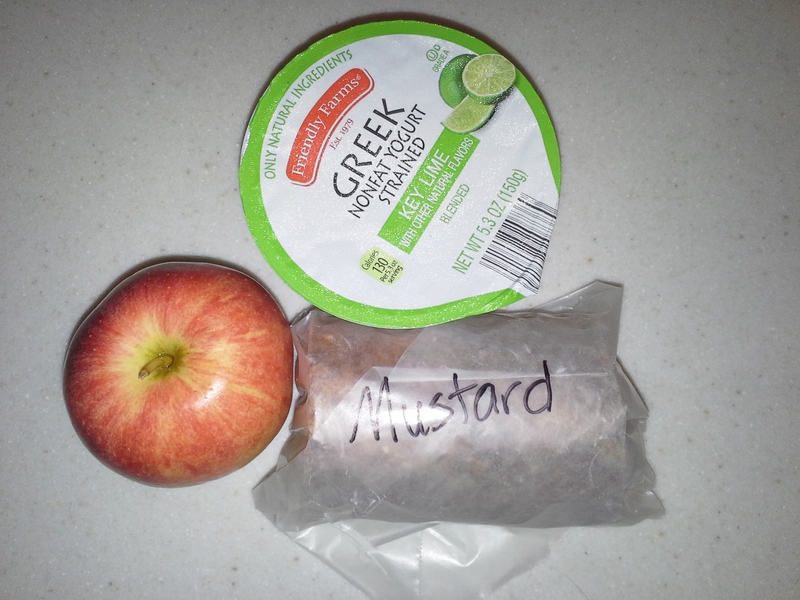 Add to that a yogurt at .75 and apple at .34 for a lunch total of $2.05. 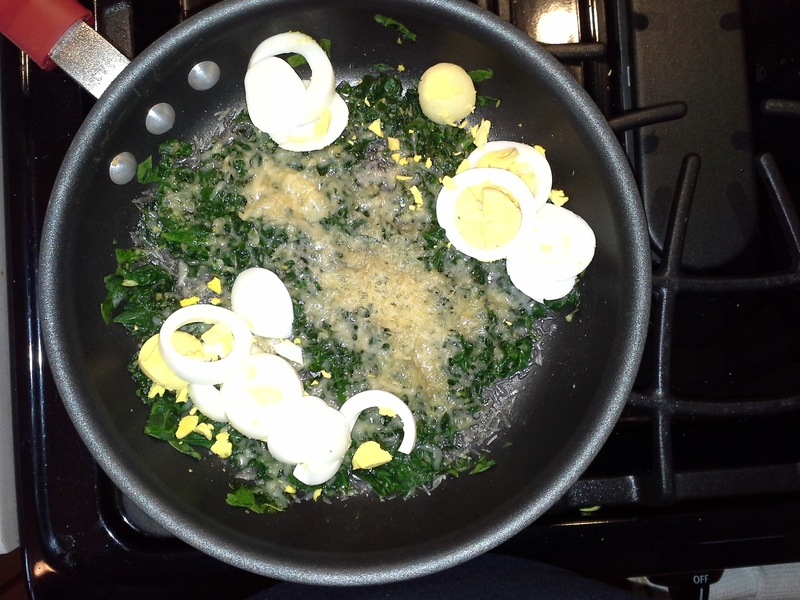 Dinner: Spinach (left over from the sub sandwiches–1.69) garlic .07, olive oil .05, shredded Parmesan (the last 1/5 of the wedge–.99) 2 eggs .58. This is two servings. So for tonight–1.69. Add in 1/2 bowl of Bean soup…. Total for the day: $4.37. 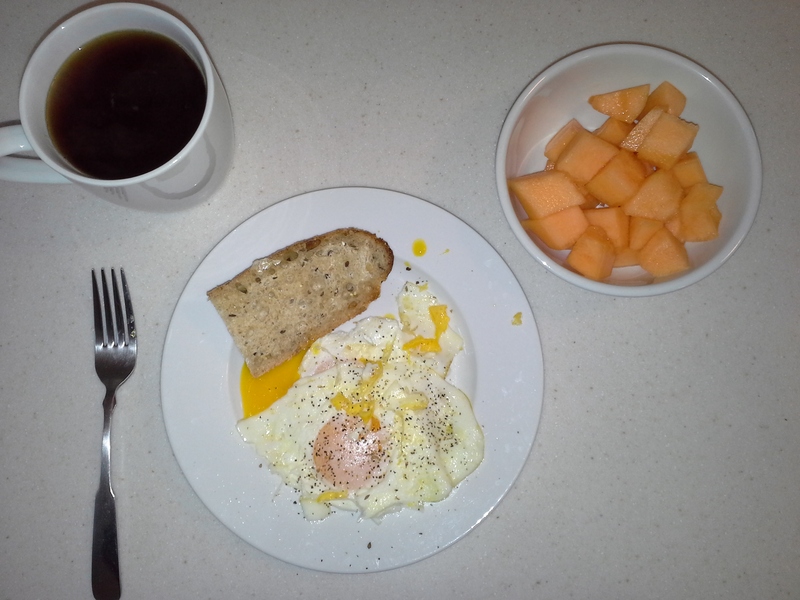 Breakfast was 2 eggs over easy (.58*) 1/12 a baguette that I found marked down to .49–so, .04 for my breakfast piece, 1/4 cantaloupe .25 and tea .10. Lunch was another bowl of the Thai chicken $2.63. 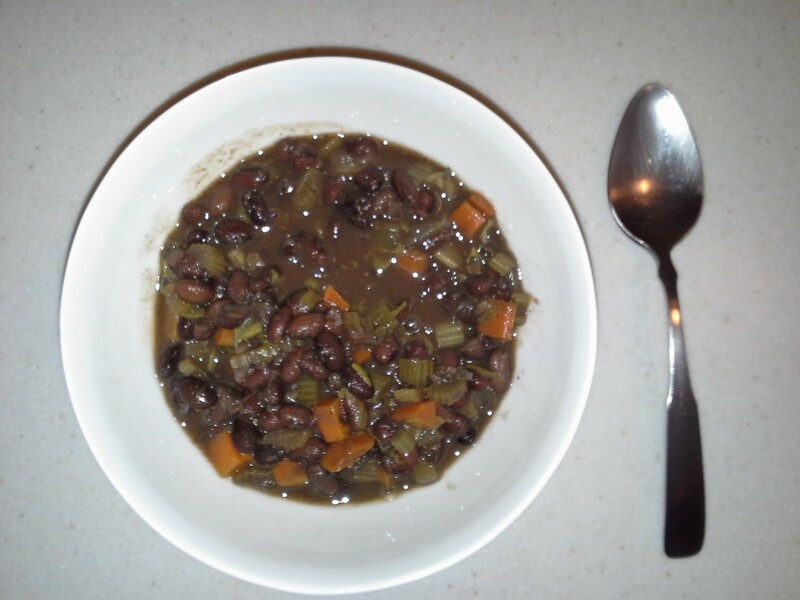 Dinner was black bean soup .32 (olive oil .05, beans .80, 1/4 clove garlic .07, onion .25, 2 carrots .33, 2 celery stalks .33, salt and pepper .10= $1.93 for 6 servings.) and an apple .34. Total cost of food for the day $4.26. 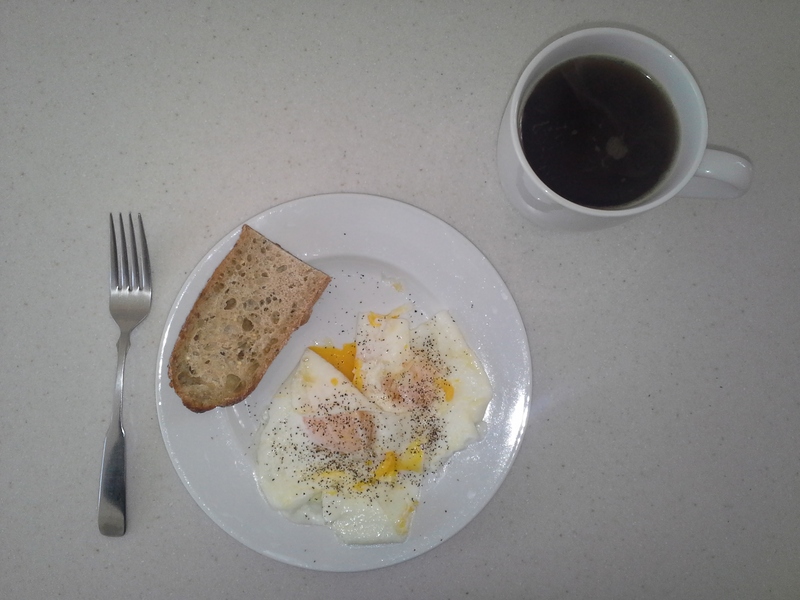 *the eggs were free-range from Target at $3.50 for a dozen. I thought we had put this topic to rest a couple of years back, but yesterday I was told emphatically that it is difficult for the poor to eat healthily by someone who is not poor and has not tried to eat frugally for many years. The media say, “It’s hard” and without personal experience to contradict it, is believed. 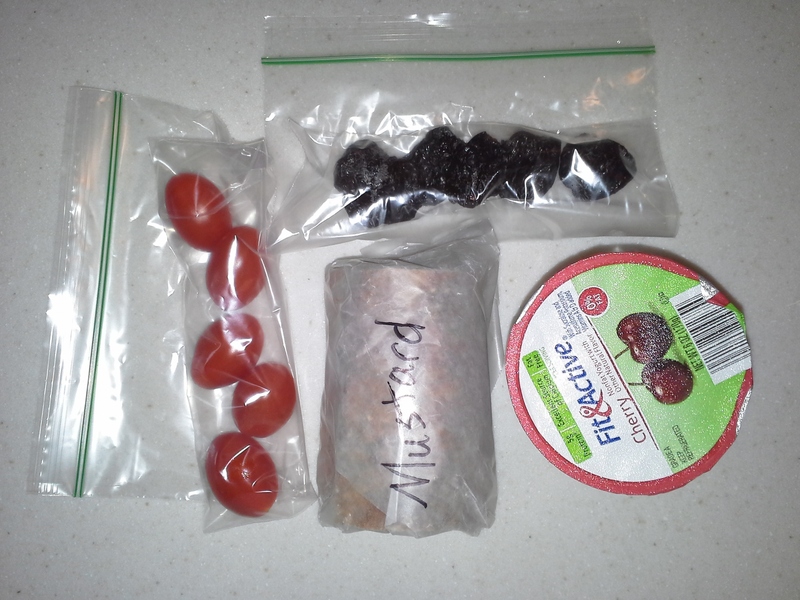 By previous posts, I have demonstrated how a family can eat healthy food frugally. Now that it is mostly me, I’ll show how one person can do so. I will post daily for the next week my menus and cost of food. Photos and recipes as I have time. 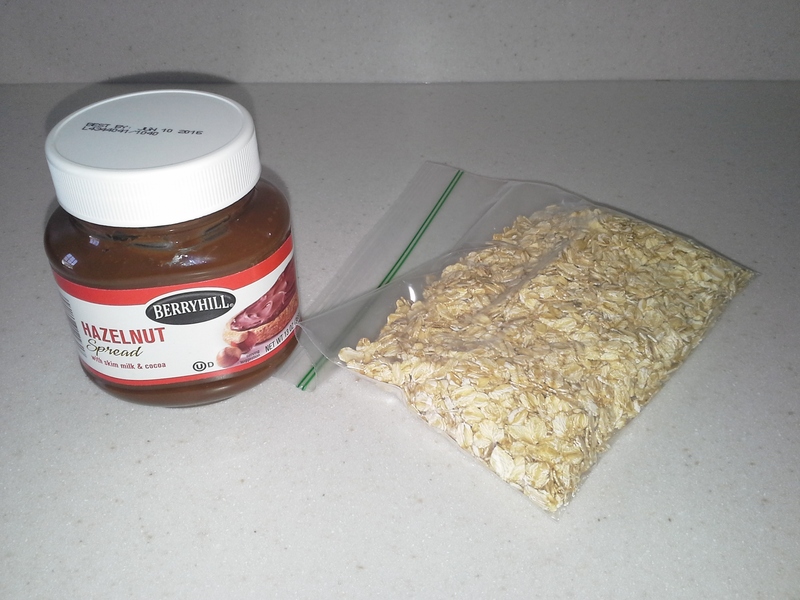 I keep the Nutella in my drawer at work and bring in the oatmeal. I mix it with hot water in the work kitchen. Can of soup-$1.19 and hot chocolate made with 8 oz Almond milk (0.31) and a 1.4 oz melted chocolate bar (.40) Cost of lunch– $1.90. Homemade Thai Chicken and vegetables (this recipe made three servings): 3 chicken breasts (2.25), 1/4 clove of garlic(0.7), onion (.25), 2 carrots (.33). 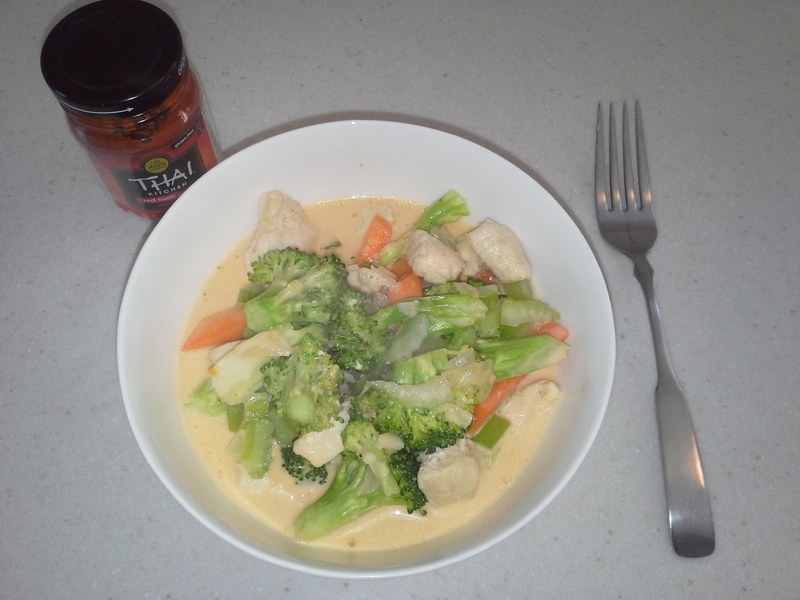 3 celery stalks (.33), 1/2 crown broccoli (.70), 13.66oz can coconut milk (1.29), red curry paste (1 oz. at .88*), pre-cooked wild rice packet (1.79.) So each serving is $2.63. Total cost of food for Sunday $5.16. *all food purchased at Aldi and prices from receipts unless noted otherwise. Red curry paste was from Shop N Save and if memory serves was about $3.5 for 4 oz. 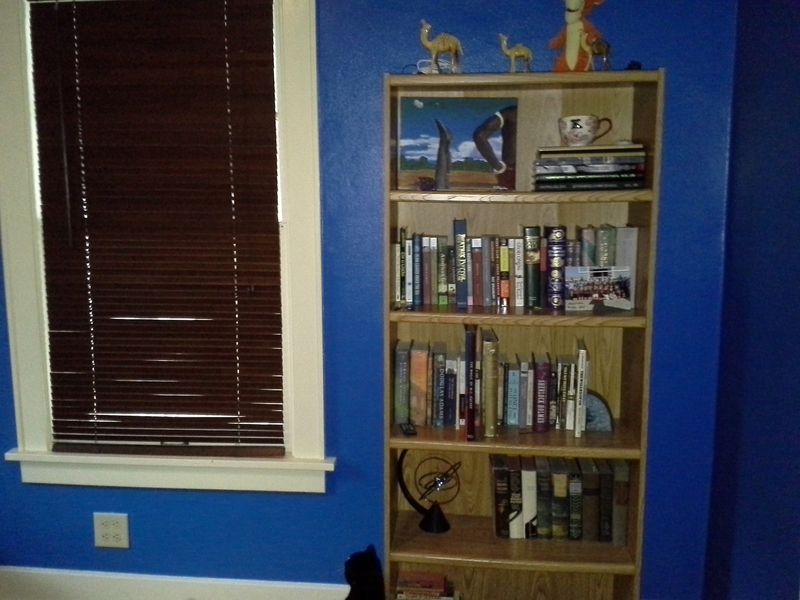 Here’s what I have been up to in the past month: my daughter gave me permission to repaint her room. She is away at school and will be for much of the summer, working on an internship. 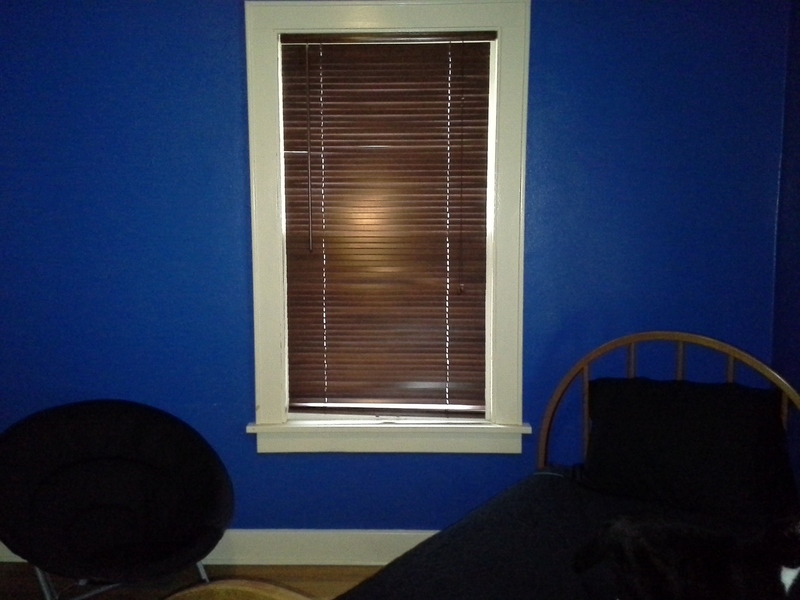 She had preferred this cobalt blue and had paired it with black sheets and comforter for a dramatic teen room. 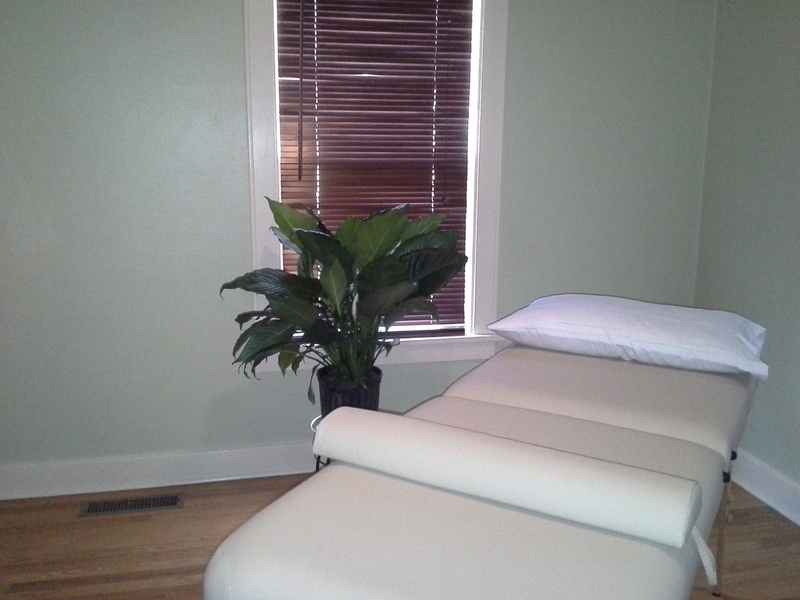 I intend to use this room for my Reiki clients. It took four coats of primer to cover the blue, and then I painted it a soft green. 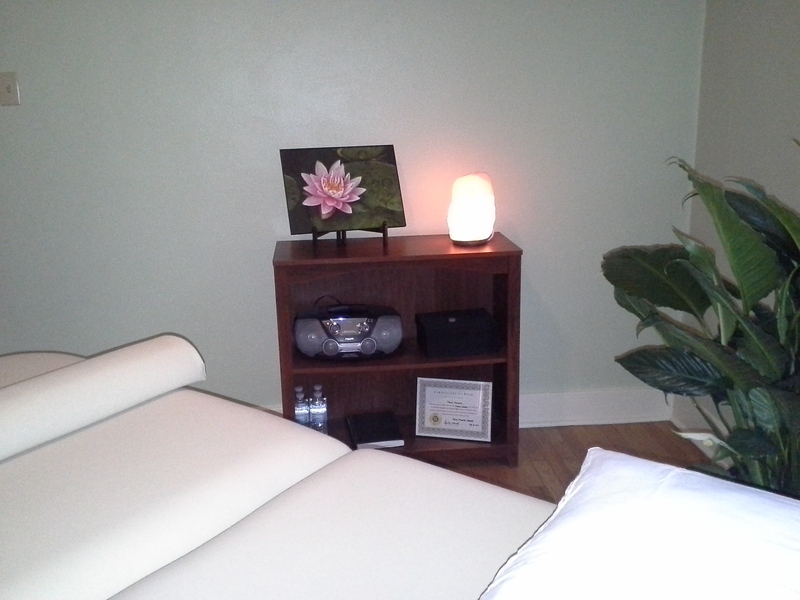 I added a massage table and some calming accessories.